We LOVE all things tandem! Anyone who visits us knows it. A few years ago, our daughter thought we had too much and took pictures of all the tandem things – over 50! – around the house and posted them up on Facebook. She thought that it would show her friends who didn’t believe her just how much stuff we had and they would be appalled. Well that backfired! All of our friends just loved the stuff and a few of her friends did too…well maybe not the tandem bathroom hand towels. With the holidays approaching, we thought it would be good to let you know of a few of our favorite websites for buying tandem themed goods. Bicycle Gift Hub has everything from oven mitts, ornaments, stationery, glasses and even a tandem wine caddy. Flower Pedal has tandem figurines, jewelry, ornaments and wall hangings. Hayneedle has a really nice “Best Day Ever” tandem coir door mat. 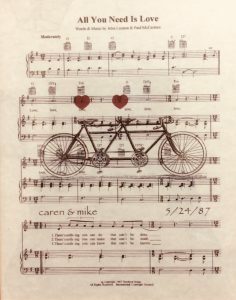 Bicycle Gifts has tandem jewelry, posters, a clock and a tandem key holder. Uncommon Goods has personalized glasses, pictures and some cool bike chain coasters. Search Amazon and you can get other tandem related stuff, like these tandem pillowcases and comforters. Tandem bicycles are considered romantic and weddings use them all the time. So websites Etsy, Zazzle and Cafe Press all have tons of tandem stuff. Just search for tandem and you’ll see t-shirts, coffee mugs, stationery, napkins, invitations, etc. I really like the WordsAndMusicArt store on Etsy. It’s where we had the All You Need is Love sheet music printed. So if you have a favorite tandem item that you have bought recently and can show me where to get it, please email AdventuresInTandem@gmail.com.